Weekend mornings in my house, especially Sundays, are all about sleeping in, lingering at the breakfast table, and reading the newspaper (yes, the one with the mashed pulp and ink that ends up on my walls by the light switches). Since we eat a later breakfast, I like to serve something that will fill us up until happy hour. 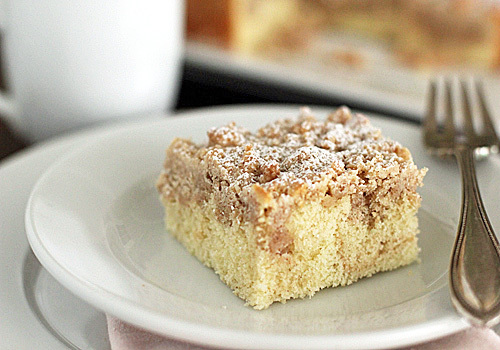 This crumb cake certainly does the trick. I have never been to New York and I don't know the first thing about New York crumb cakes, but I do know that this recipe is delicious. This cake is all about the crumb topping--little pebbles of brown sugar and butter sweetened with a hint of vanilla and cinnamon. The cake, although dense, is the perfect base to support the heavy crumb layer. The recipe calls for cake flour; please do not substitute. Using all-purpose flour will make a dry, tough cake that you could probably use as a hockey puck or dangerous projectile rather than a delicious breakfast or break-time treat. I do recommend baking this the day before. The resting time gives the cake that "next day better" taste and it will give you more time to enjoy that weekend newspaper. Oh, and even though I am not a big coffee drinker, I do break out my French press for this--it is a tasty pairing. Note: If you are a regular reader, you will notice that I like to use extra large eggs in my recipes. I like them because I think you get a little more for your dollar and the end result when using extra large eggs in baking is a little nicer. But, you can certainly use large eggs if that is what you have on hand. *This recipe can easily be doubled for a larger crowd. Baked it in a 9x13-inch baking pan and increase the baking time 5 minutes. In a medium bowl, whisk together the sugars, cinnamon, salt, and butter to combine. Using a rubber spatula, stir in the flour and mix until you have a thick, cohesive mix; set aside to cool to room temperature, about 10-15 minutes. Adjust the oven rack to the upper-middle position and preheat to 325ºF. Cut a 16 x 14-inch piece of parchment paper and fold lengthwise to a 7-inch width. Spray an 8-inch square baking dish with non-stick baking spray and fit the parchment into the dish allowing the excess to over hang. This will make the cake easy to remove after baking. In the bowl of a stand mixer fitted with the paddle attachment, mix flour, sugar, baking soda, and salt on low speed to combine. Keeping the mixer on low speed, add the butter one piece at a time until the mixture resembles moist crumbs, with no chunks of butter remaining, about 1-2 minutes. Add the egg, yolk , vanilla, and buttermilk. Increase the speed to medium-high and and beat until light and fluffy, about 1 minute. Scrape down sides and bottom of the bowl and briefly mix again. Pour the batter into the prepared baking pan and spread into an even layer. Break apart crumb topping by rolling the broken dough between your thumb and forefinger to form crumbs about the size of large peas. Sprinkle the crumb pieces evenly over the batter, beginning with the edges and then working toward the center. Do not press the pieces into the batter. Bake for 35-40 minutes until the crumbs are golden and a wooden skewer comes out clean. Cool in the pan on a wire rack for at least 30 minutes. Using the parchment overhang, remove the cake from the pan. Transfer to a serving plate. Dust with confectioners' sugar right before serving. Cake can wrapped in plastic wrap and stored at room temperature for up to 2 days. Enjoy! I love this because I have ALL the ingredients in my fridge and cupboard! And I LOVE that you are helping me use I the quarter gallon of buttermilk I bought and have left over from your ranch dressing ~ a major plus:) Looks delicious and I'm going to make it tomorrow (Sunday) so we can start our Monday off right! 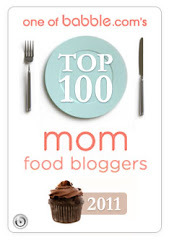 I can't wait to try this recipe, especially since it's better to bake it a day ahead. How could I modify this recipe to make muffins? That way Dad and I wouldn't be compelled to eat the whole thing at once. This looks too delicious to waste even a crumb. A muffin would be a perfect serving size for us. Yes, you can make these into muffins:) Line a standard size 12-cup muffin tin with liners. Divide the batter evenly into the muffin cups, about 1/4 cup. Sprinkle with the crumb topping and bake for 20 minutes or until golden. Thanks! Dad will love these. This cake is delicious. I loved the crumb topping. It wasn't as sweet as a streusel and it had a lot more texture. I did make the muffin size. Next time I will be sure to divide the mixture into all 12 cups. I made only 8 and it didn't leave much room for the crumb topping. I used a generous 1/4 cup. Next time I will try a scant 1/4 cup. You are right. They are excellent the next day. Thanks! I wish I had a hunk of this right now...with a nice cup of coffee. Just wanted to let you know that for breakfast this morning, I pulled out the leftover crumb cake muffins I had frozen in February. I was about to throw them out, thinking that by now they would be hard, dry, and stale. Much to my surprise, the muffins are as wonderful as the day I baked them! Thanks for a delicious breakfast.